When asked to give a congratulatory message to former screen partner, Gerald Anderson said: "Kim, congratulations. Alam ko, sobrang stressful ang ginagawa mo..." The Kapamilya actress plays a dual role in My Binondo Girl. Gerald Anderson said his recent dinner with Kim Chiu in Eastwood was not a "date." "Nagkita kami," he said, stressing: "It's a friendly get-together." When asked to elaborate, he just gave one-liners. PEP.ph (Philippine Entertainment Portal) interviewed Gerald at the Ready, Get Set, Go! Faaster! event of Puma yesterday, August 20, at TriNoMa in Quezon City. "It meant nothing," he said, looking a bit awkward. "Wala... Nagkita lang kami dun... Nakita ko siya. 'Tsaka marami po kami. Kumain po kami lahat, [at] siyempre, merong kuwentuhan." The Kimerald fans, according to one reporter, were ecstatic. "That's good," was his brief comment. MORE ABOUT KIM. His tandem with rumored ex-girlfriend ended with the film, Till My Heartaches End, which was released in October 2010. Presently, Gerald is busy with Budoy, ABS-CBN's upcoming series. Kim, on the other hand, has a film, My Binondo Girl, set for release on August 22. "Nag-start na po yung bago kong soap... Ganun po talaga, sanay po kaming magkasama sa isang soap. This is the first time na magkakahiwalay kami," he said. He admitted that he misses the Filipina-Chinese beauty, adding: "Kailangan naming dalawa" to spend the time apart. He warmed up at the mention of Kim's transformation into a boy in the latest Star Cinema offering. "Ako talaga iyon, e. Kasama ako sa Binondo Girl," he joked, before adding, "Sobrang cute, sobra akong nakukyutan sa hairdo niya. "Nagulat ako actually... Hindi ako masyadong familiar sa kuwento niya pero nung nakita ko na-kyutan ako sobra." Does Kim still talk or confide in him? "Yes, nandito ako para sa kanya. Ganun po talaga, sinabi ko sa inyo dati 'yan na yung pagkakaibigan namin, mananatili po kaming magkaibigan talaga," Gerald said. Likewise, he still makes himself available for Kim's family gatherings. Recently, he attended the birthday of Lakambini, sister of the chinita actress. "In-invite ako ng ate niya," he said. "Friends kaming lahat... Hindi po nasira [ang friendship.]" UPCOMING PROJECTS. 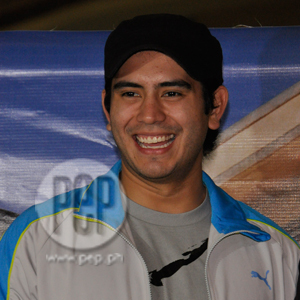 Gerald's next movie will be with the Pop Star Princess, Sarah Geronimo, his co-star in Catch Me, I'm In Love. Any plans to court Sarah? "Well, tingnan natin. Hindi ko naman sinasara yung door. Sa ngayon siyempre importante po yung makilala ko siya, makilala niya ako." Gerald also said his last movie with Sarah gave him the chance to work with Christopher de Leon, who played the role of the President. The 22-year-old actor was speechless for a few seconds, before exclaiming, "Wow! Thank you, thank you po." He added: "Actually sobrang bait po [ni Christopher]. Nakasama namin siya sa unang movie namin ni Sarah... Siya po yung tatay ko dun. "Sobra po akong blessed na nakasama ko siya dun. Ang dami ko pong natututunan sa kanya kahit pinapanood ko lang siya. "Pero sobrang sweet niya para sabihin niya yun. Thank you po Nakaka-overwhelm. Nagulat ako dun." Lastly, Gerald talked about his next TV series which will also star Jessy Mendiola, whom he described as "professional and mabait." It's too early to tell whether reel romance will turn into real love. "Hindi pa malalim yung relationship namin dahil kakastart pa lang," he said. Gerald's reaction to Jessy's comment that he's "boyfriend material? "Vice versa... Siya din, napakabait po talaga niya. Mahal po niya ang pamilya niya, yung nanay niya. Girlfriend material din po siya."